Synonyms: Hinomaru Sumo, Sumo of the Rising Sun, Sumo Wrestler Hinomaru, Kiseki no Mattanashi Taiketsu!! Published: May 26, 2014 to ? Do you know anything about Sumo? Do you like Sumo? Neither do I. But that doesn't stop this manga from being any less enjoyable to read. The story isn't groundbreaking. It's your standard sports shounen plot, but it's done well. It progresses at a nice pace and keeps it interesting. The characters are where Hinomaru-Zumou really shines. Especially the protagonist. Multidimensional, well-written, likable/interesting, understandable backstory... It's all there, and then some. 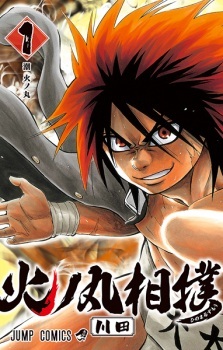 If you're looking for a fun new manga to pick up, Hinomaru-Zumou is a pretty good choice. Awesome title. Let me see... A lot of cool fights without magical powers (until now at least - chapter 13 released this week xD), a truly original theme (sumō), the super nice cliches of boy's manga like friendship, superation, nice hairs even for the manly dudes (shonen jump after all). Totally worth it. Seeing sumo as a main sport in a manga is original and something really different to see. At first I was a little skeptical because it's Sumo and never really seeing the sport gave me low expectations. However all that changed seeing the main characters and their rivals go at it making it such and interesting story and sport. After seeing many sports in animes and mangas, this one stands out the most having engaging characters and seeing good action with amazing art. It's a good read that never gets boring and always has something exciting going on. Hinomaru Zumou... The last spokon manga of the Weekly Shônen Jump which has been relatively successful. First of all, I find worthy of admiration that the author Kawada decided to a manga about such a sport as Sumo. I personally don't know nothing but a few things about Sumo. I know it's a very prestigious and ancient sport in Japan, but despite it, it's also a too little popular sport among young people like me, like you, and like the average Shônen Jump reader. Two almost naked fat men almost fighting while grabbing his underwear? Honestly, I understand why is not very popular. In fact, despite obtaining first place at its first week in the Shonen Jump ranking (That definitely is quite an achievement!) its volumes aren't sold very well. Said this, let's go piecemeal. Hinomaru Zumo has the typical spokon story: An apparently weak boy with the determination of be the best who joins his new high school (x sport) club and improve it and this kind of things that we had seen before. It's not so bad but it's just the typical story (At least to date). Because of this I think 5 (a pass mark after all) is a fair mark. Here is where Hinomaru Zumo really shines. While other spokon series like Kuroko no Basket or Haikyuu has a quite lame drawings at its first chapters... Hinomaru Zumo has started with a notable art. Double pages of sumo matches are, in my opinion, amazing. And the best part is that, like Kuroko no Basket's and Haikyuu's authors when they started their series, Hinomaru's author is just a rookie! Or at least this is his first serialization. Either way, I'm sure that, like Fujimaki-sensei and Furudate-sensei, he will improve even more his artistic skills. They are fine. There are a good amount of characters, all of them different from each other, like in a good spokon it must be. At date I couldn't see much of their development as characters, but it seems fair. Enjoyment: I'm sure that, if you are interested in Japanese culture like me, you will enjoy it. Reading this manga allowed me to see Sumo more like a very exotic, honorable and spectacular sport, and not so lame as I thought. And, although it's quite cliched you will probably enjoy this cliched things here. So I give a 6'5 mark to the enjoyment headland. By doing the arithmetical mean, I obtain an 6'25 overall mark. 6'25 rounded off is a 6. So I give it a final 6 mark, and I recommend it if you like spokon. Sometimes phenomenal manga series get passed over and don't become a TV series. This is a list of the top 10 martial arts manga that should've been made into an anime. Prepare yourself. These stories kick hard.